Raising funds for a new NGO is truly challenging. Funding sources and new ideas are rare, and it takes a lot of planning, organizing, collecting, tracking and reporting. It would be more challenging if you establish an NGO without identifying funding avenues. When you are new to the world, it is evident for the people not to know you. Therefore, it is essential to communicate with other organizations and make contacts. Once you build a relationship with them, it will be easier to get credibility. New NGOs particularly face problems in generating funds from large organizations as they prefer to provide financial support to experienced organizations. But this does not mean new NGOs should feel discouraged. There are many agencies which offer programs to provide small and large size grants to new ideas, promising efforts, potential scale-ups, and even new NGOs. One of the tedious task for new NGOs is to gain the trust of international agencies and to secure small or large funding for projects. It is a must for new NGOs to strategize and implement fundraising plans in the correct path. This ebook offers you all the technical know-how to be able to kick-start your fundraising efforts for your new NGO. It primarily focuses on providing tips, tools, and techniques of fundraising for new NGOs. 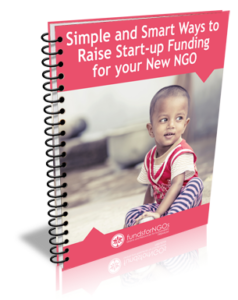 To get detailed information, you can download this guide on “Simple and Smart Ways to Raise Start-up Funding for your New NGO” available exclusively for our premium members. If you are a FundsforNGOs Premium Member, you can download this document by logging in here. Our NGO ” UNMESH” is working in the field of Environment. How can we get funds in India ? Our fundsforNGOs Premium membership service provides a large collection of tools and resources that will help NGOs in identifying right donors, how to contact them, how to approach them with your project proposal and how to win grants. Thank you for your interest in fundsforNGOs Premium. Premium membership comes with a range of valuable features like resource guides, sample proposals, daily funding opportunities etc. How can get funds to improve skills of debate, speech and creative writing in Uganda? We are Rohingya Education Board Organisation newly established to work together to create a dynamic, inclusive and respectful learning environment that supports and encourages individual achievement and well-being as well as creates the opportunity for all Rohingya children to be productive and responsible in society, capable of competing in the global economy and motivated to pursue lifelong learning. Our goals are sets to strengthen the capacity of the community to support education and reduce gender disparity in education and increase literacy through inclusive education for Rohingya people. Therefore, we are looking for funding and traditional donors organisations to implement or explore our work in Bangladesh refugees camps. We would appreciate if you can provide or guide us in the right direction. Our NGO is and on going with Sustainable Social Economic Development projects with innovative ideas and good human resources in Agriculture and Education sector, we need help to promote this project and develop our rural living people in Sri Lanka please guide us.